It’s been a long, busy summer, so it felt great to kick off the fall with our September meeting, featuring two stellar guests: Maggie Marr and Debbie Decker. Many of us in the RWASD community are familiar with Maggie Marr; not only is she a USA Today Best-Selling Author and 2017 RWA PRO Mentor of the Year, but she’s also a longstanding member of our sister chapter, LARA. On Saturday morning, Maggie came to speak to us all about what it takes to get your movie made on the big screen. Getting a movie deal is the author’s dream – but it’s certainly one that doesn’t come easy. While everyone in Hollywood is always looking for great material, Maggie says that everyone is also afraid to say yes. This is especially true of the romance genre; we’re a business built by and for women, but unfortunately, women only make up 6% of the Director’s Guild of America. Traditional movie deals can be hard to come by for romance authors – but with the advent of over-the-top (OTT) television production, including the newly minted PassionFlix service, there are more opportunities than ever before for romance authors to get their big Hollywood break. 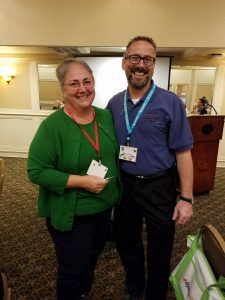 After Maggie clued us into the difference between a shopping agreement, an option agreement, and a purchase agreement, Debbie Decker took the podium to tell us all about hooks. According to Debbie, there’s no more powerful method of selling your book than crafting a good hook. The first three pages of your book needs to engage, entice, and incite the reader with an event that pulls them into the story and makes them want to learn more about what happens. She gave us some tips on how to develop strong hooks, by using something unexpected, something surprising, or something dangerous. And she also told us how important it is to know the history and the wound of your protagonist. Hooks aren’t only for beginnings, though; they must be threaded throughout a story, to keep readers effectively turning pages. At the end, the hook should be tied back to the beginning, to create a full circle with a satisfying resolution. And that last hook, Debbie says, will help you sell your next book. Ellen Philpot (l.) and President-Elect Rick Ochocki. Aside from our amazing speakers, we also handed out our monthly awards. The Member of the Month went to Patrizia Hayashi, who helps keep our classes running smoothly every month from her home all the way in Japan. Our Atta Girl was handed to Ellen Philpot, who’s been keeping her writing going despite some challenges on the homefront. Jackie Leigh Allen’s new novel, Reno Rebel, was accepted by Desert Breeze and will come out in March, just in time for RT in Reno in May. Susan Burns entered her first YA into a contest. Aleigha Siron’s Finding My Highlander hit #1 for Time-Travel Romance on Amazon. Marie Andreas’ Warrior Wench won a Prism. Her Victorious Dead was also an RT Top Pick, and she had two proposed panels accepted for the RT conference. Demi Hungerford received an R&R. Kym Grosso will be teaching an ACX University Class. Jane Josephs submitted to Soul Mate Publishing. Mickey Brent’s first novel, Underwater Vibes, will be released in October by Bold Strokes Books, with a sequel forthcoming in 2018. Join us next month, when our guest speaker will be Chris Green. She’ll be offering two workshops: one on “Pied Piping the Muse” and the other on opportunities for freelance writing in today’s market. See you in October!